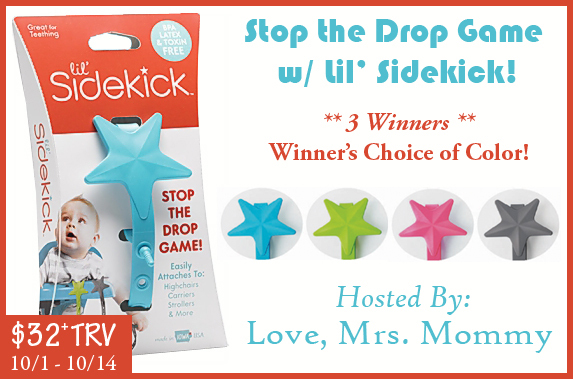 Love, Mrs. Mommy: Lil' Sidekick 3 Winner Giveaway! Winner's Choice in Color! Lil' Sidekick 3 Winner Giveaway! Winner's Choice in Color! A Lil' Sidekick in their choice of color! Options include: Pink, Blue, Green or Charcoal! Disclosure: Love, Mrs. Mommy is not held responsible for sponsors who do not fulfill their prize obligations. Love, Mrs. Mommy received a Lil' Sidekick at no cost to facilitate the above-mentioned review as well as nominal monetary compensation to host this giveaway. This giveaway is in no way endorsed or sponsored by Facebook or any other social media site. The winner will be randomly drawn by Giveaway Tools and will be notified by email. The winner has 48 hours to reply before a new winner will be drawn. If you would like to participate in an event like this please contact LoveMrsMommy (at) gmail (dot) com. 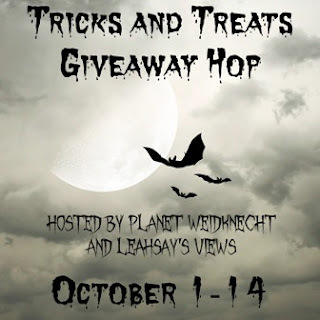 The Tricks and Treats Giveaway Hop is brought to you by Planet Weidknecht and LeahSay's Views. Be sure to hop around to all the other blogs participating in this fun hop. There are lots of prizes up for grabs! Have fun!